ISLAMABAD: US Secretary of State Mike Pompeo reached Pakistan today for the first high-level official meetings with leaders of the newly-elected government in Islamabad. 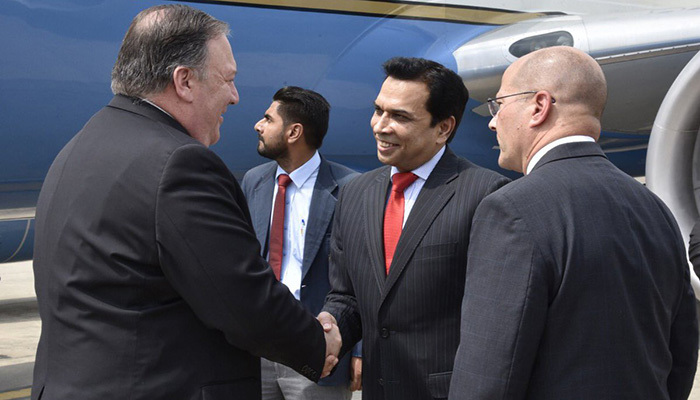 During his visit, Pompeo is accompanied by US Joint Chiefs of Staff Chairman General Joseph Dunford, underscoring its counter-terrorism focus in engagements with South Asian partner. It is learnt that the Pomepeo-led US delegation will hold formal negotiations with Foreign Minister Shah Mehmood Qureshi and his team. The visitors are likely to hold a separate meeting with newly sworn-in Prime Minister Imran Khan. Regarding the visit of US delegation, Shah Mehmood Qureshi says his meeting with Pompeo will provide an opportunity for the two sides to exchange views and try to improve strained ties. The relations between the two countries have deteriorated to the lowest ebb since Trump, while announcing his South Asia policy, accused Pakistan of not fully sporting US-backed war against the Taliban in Afghanistan. Pakistan consistently denies the allegations as its people have made unmatched sacrifices in a bid to eradicate the menace of terrorism to bring stability and peace of in the region. The Pentagon also announced last week it has decided to scrap $300 million in military aid to Pakistan, citing the country’s lack of cooperation with Trump’s South Asia strategy. But Qureshi swiftly dismissed the assertions, saying the money was not the US aid, but reimbursements for expenses incurred by Pakistan from its own resources for fighting regional terrorism in support of Washington’s counterterrorism efforts.